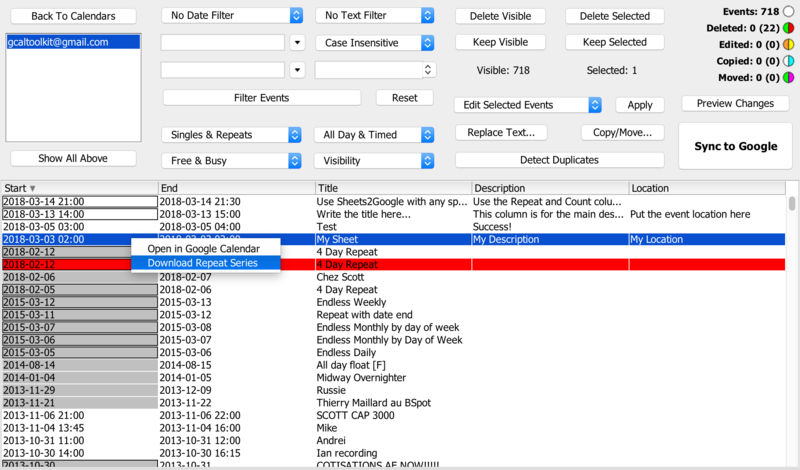 This short article explains how to print customized lists of your Google Calendar Events using GCalToolkit, and export them in spreadsheet format. You can also choose to print the "Month" or "Week" view, or an "Agenda" view which displays the event range you have selected in a list. You can also change the font size, and print in black and white to save on expensive color ink. On the same subject, remember to print in "Draft" mode if you don't need a high quality copy. That's all fine if you just want to print a copy of what you see in Google Calendar, but if you want to export custom lists of events filtering by keyword, type of event (free only, private only, all day only etc.) then GCalToolkit can help you. 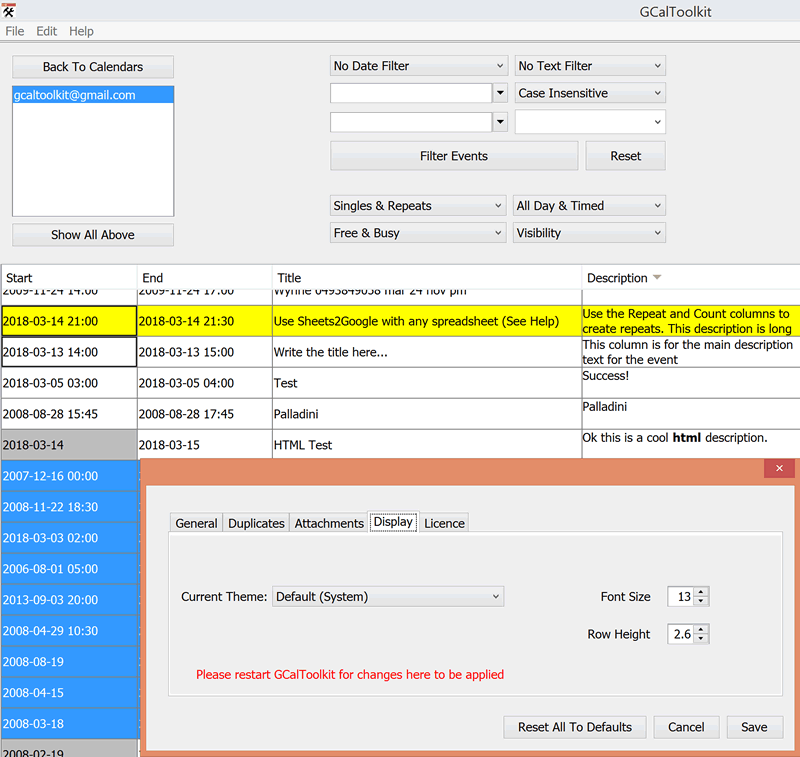 Use GCalToolkit to display or hide the columns you wish to print - very useful if you want to print out the full description field for each event, or the location, the busy/free status etc. You can also export in the TSV format, a spreadsheet format similar to CSV but using "tab" to instead of "comma" in the file. You can open and edit the output file with any text or spreadsheet software such as OpenOffice, Google Documents or Excel. If you do not have PDF printing on your system you can use CSV to export from GCalToolkit - this will save a file complete with the columns you have selected to display in the program. By opening the CSV file and configuring the "Date" column as a date in OpenOffice, for example, you can change the date format to include the week day, omit the time and so on. When you load your calendar into GCalToolkit you can select the option "Download Date Range as Single Events", although this is not recommended (for quota reasons) unless you need to or print every instance of all repeat events, or need to delete multiple singles duplicating repeats. With this option the entire repeat series of every repeat in the date range will be displayed. By default, i.e without checking this option, a repeat event is a single row in GCalToolkit - but you can right-click on any event to expand its series to multiple single events... or select multiple events and use the "Edit" menu option, "Download Repeat Series". Repeat events have a black border around the Start. Right-clicking events also allows you to view them in Google Calendar directly. Where you go from here is up to you: GCalToolkit helps you export the raw data that you need so that you can format the spreadsheet display to your heart's content. Let me know how you get on. Download GCalToolkit today below or from the "Download" page of this website. Bulk edit event reminders, busy/free, privacy etc. 100% Satisfaction - Money Back Guarantee!